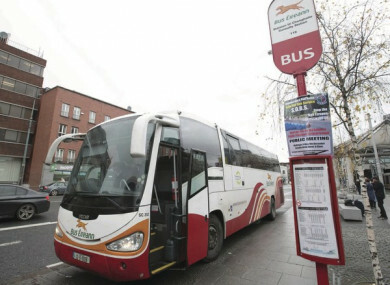 FOLLOWING DISCUSSIONS AT the Workplace Relations Commission last night, management at Bus Éireann has agreed to introduce “improved” rosters for its drivers, a union has said. In a statement to TheJournal.ie, Dermot O’Leary of the National Bus and Rail Union (NBRU) said that “a vital component” of the dispute was agreeing on rosters across the Bus Éireann network. In keeping with a Labour Court recommendation earlier this year, a clarification document has been issued to both sides for all issues relating to drivers’ conditions – including an implementation date for all new rosters. “The problems on the Navan/Kells corridor have been generating quite an amount of press coverage over the last couple of months,” O’Leary said, “With service difficulties for commuters and oppressive anti-family rosters for drivers being the core issues which required to be addressed. Bus Éireann management have now agreed to implement improved rosters on the Navan service, effective from Sunday next, with nationwide implementation to follow on the 3 December. Since mid-September services in the northeast, including the Navan-Cavan 109 route corridor, have experienced problems such as buses routinely failing to turn up, services being cancelled with little or no notice, and even drivers taking incorrect routes. The company blamed the situation on the addition of new rosters and new services together with “a high level of absenteeism”, which prompted the Minister for Social Protection Regina Doherty to declare that the situation amounted to an “unofficial labour dispute”. Doherty said that 299 replacement services had to be drafted in to cover the eastern bus corridor because drivers weren’t showing up for work. But a number of drivers told TheJournal.ie that the problem isn’t one of absent drivers, but rather one of non-existent buses and unrealistic service demands. In a statement released last night, Bus Éireann said that last night’s agreement will ensure “cost savings can be achieved” and “assures our commitment to all of our customers and stakeholders at this busy time of the year”. The clarification document issued to both sides provides for an implementation date of 3 December next for all elements related to the driver grade, which were part of the Labour Court agreement accepted earlier this year. Email “New 'improved' rosters for Bus Éireann drivers in Navan from Sunday - NBRU”. Feedback on “New 'improved' rosters for Bus Éireann drivers in Navan from Sunday - NBRU”.